When you photograph a sunrise the best colours begin about an hour before the sunrise. If the sunrise is at 5:30, then you have to set the alarm for 4:00. There are not many people about at that hour, but nature comes alive as it gets lighter and the birds start to sing. 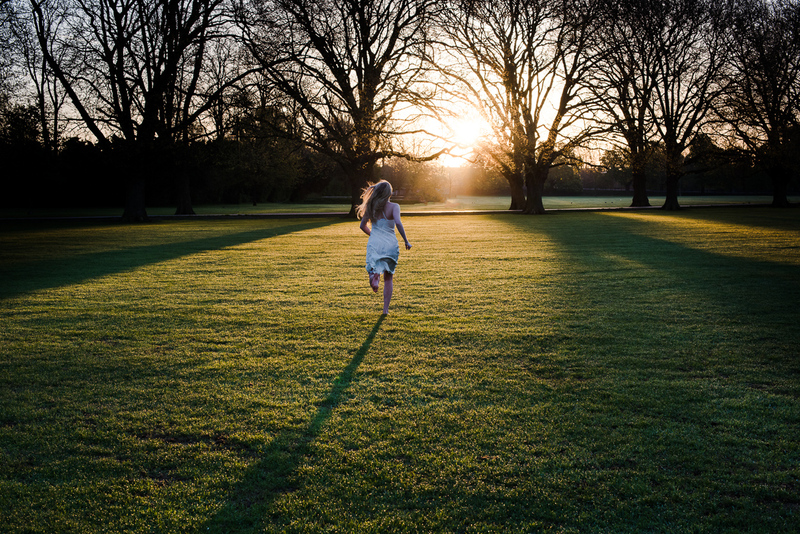 Matilda and I did a photoshoot early in the morning on Jesus Green, here is a selection of the photos from our shoot. Teasing the curtains of Timidity. wraps around my waist, spinning merrily. “Let go! Let go!” the sunbeams sing. Flowers pirouette prettily in their shining glass. The scent of unchartered wonder fills the air. This is a crop of the original photo, putting the emphasis in the photo on Matilda’s arms and all the negative space around her. The water was very still on the lock, which allowed us to better capture Matilda’s reflection. Here I was getting in closer to cut out all the distracting elements in the background. There is a circular patch on Jesus Green covered by stones. By having Matilda sit in the centre of the circle we get the lines in the stones leading in towards her. The greatest colours might be before sunrise, but I like the shots we got after the sun rose about the horizon the best, with the long dramatic shadows. Running off into the sunrise. The wet grass is very cold, so we could only do a few takes of this shot. We also experimented a bit with a few hair tossing photos. Note the gentleman on the bike in the background, adding to the layers of the photos. It was a really early morning, but it was a very fun shoot. You get to see a different side of Cambridge at this hour, and it is interesting to see the town come to life, with the morning joggers, dog walkers and early bikers. Many thanks to Matilda for a great shoot!